All great pies, tarts and pastries begin and end with the dough. Keep checking back— we’ll be adding more recipes. And for new Ready-to-Roll Dough™ fans, view my how-to videos! 1. Prepare crust following thawing and rolling instructions (steps 1 through 5) on Ready-to-Roll Dough package. 2. In a large bowl, combine sugar, flour, cinnamon, and salt; add rhubarb and toss to combine. 3. Assemble and bake following steps 6 through 8 on Ready-to-Roll Dough package. In step 6, dot filling with butter pieces before folding dough over the filling. Strawberry-Rhubarb Rustic Tart filling variation: Reduce sugar to 1 cup. Increase flour to 1/4 cup plus 1 tablespoon. Add 1 cup hulled, halved or quartered strawberries. Assemble tart as directed. Here’s Rustic Tart’s favorite apple tart recipe developed just for your Ready-to-Roll Dough™. And for new Ready-to-Roll Dough fans, view my how-to video at www.rustictart.net! We like to mix apple varieties in our fillings to balance texture (tender to crisp) and flavor (sweet to tart). Some of our favorite apples are Empire (crisp, sweet and tart), Cortland (tender and sweet), Golden Delicious (holds shape, sweet with hints of tartness), and the traditional pie apple, the spicy and tender Jonathan that blends well with the sweet and crisp apple varieties. Prepare crust following thawing and rolling instructions (steps 1 through 5) on Ready-to-Roll Dough package. Toss apple slices with lemon juice in a large bowl. Combine sugar, salt, cinnamon, nutmeg, and flour in a small bowl. Add sugar mixture to apples and combine. In step 6, dot filling with butter pieces before folding dough over the filling. Here’s Rustic Tart’s favorite blueberry tart recipe developed just for your Ready-to-Roll Dough™. Keep checking back— we’ll be adding more recipes. And for new Ready-to-Roll Dough fans, view my how-to videos! Combine sugar with grated lemon peel in a small bowl; rub together with fingertips to release the lemon oil. Add flour, cinnamon and salt to sugar mixture and combine. Gently toss blueberries with lemon juice in a large bowl; add sugar mixture and combine. Assemble and bake following steps 6 through 8 on Ready-to-Roll™dough package. In step 6, dot filling with butter pieces before folding dough over the filling. 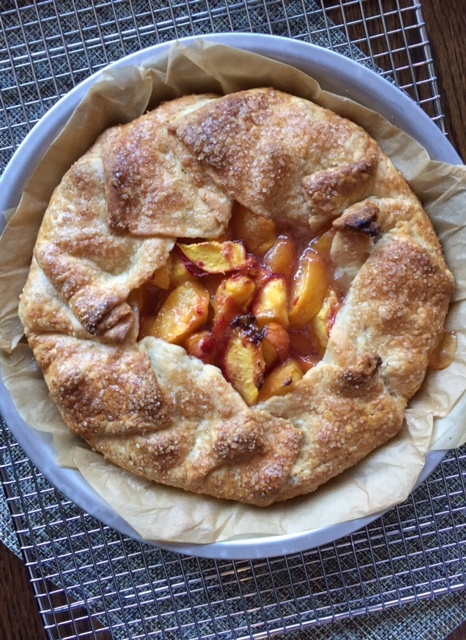 Our favorite peach “pie” is simple, rustic and delicious. With the best summer peaches, a disk of SWEET Ready-to-Roll Dough™, and our no-fuss filling recipe, you’ll bake this tart all summer long. Prepare crust following thawing and rolling instructions (steps1-5) on the back of the SWEET Ready-to-Roll Dough packaging. Toss peach slices with lemon juice in a large bowl. Combine sugar, salt, nutmeg, and tapioca flour in a small bowl. Add sugar mixture to peaches and combine. Dough packaging. In step 6, dot filling with butter pieces before folding dough over the filling. Thanksgiving is steeped in tradition, especially when it comes to pie. This pumpkin pie recipe has been at our family's Thanksgiving table for over fifty years with adaptations by my mother, Joyce Lock, and a few from me. It's tried and true and never disappoints. 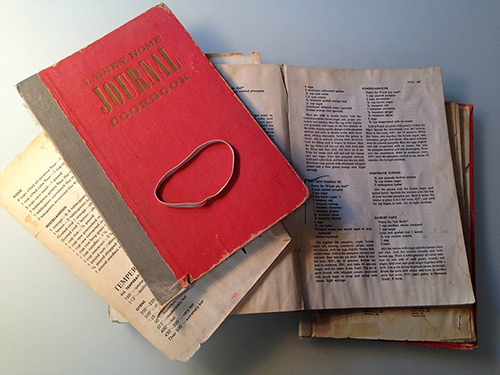 My mother recently shared our secret recipe (with the world!) in her Chronicle Books guest blog post, as the author of the brilliant Foodie Fight, Foodie Fight Rematch, and Wine Wars trivia games. The post also gives a snapshot of our family's Thanksgiving table and traditions. I hope this pie becomes one of your Thanksgiving traditions--and perhaps you'll add a few rounds of food and wine trivia games to your table, too. NOTE: Have ready a folded strip of aluminum foil to wrap around your crimped dough edge, a protective ring, in case the crust is browning too quickly during baking. Simply pull out a piece of aluminum foil (long enough to wrap around the rim of your pie plate), fold in half with the dull side exposed and use if needed. Place oven rack in center of oven and preheat to 450°F. ginger, cloves, allspice, and pepper. In a second mixing bowl, whisk the eggs with melted and cooled butter. Whisk the egg mixture into the pumpkin mixture. Pour the filling into the pre-baked pie shell and smooth the top with an offset spatula. the middle, 40 to 50 minutes longer. Place the pie on a cooling rack and let cool to room temperature. Serve with softly whipped cream sweetened with maple syrup. Leftover pie can be stored in the refrigerator up to 4 days.